Truck racing is one of motorsport’s weirder classes, taking vehicles that are the least suitable for any form of speed and cornering, and making them corner at speed. Mostly. 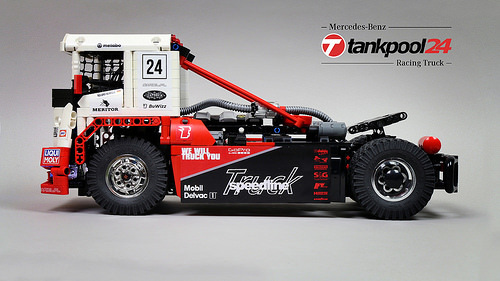 Still, the resultant vehicles are immensely impressive, and it’s one of these, the Mercedes-Benz Tankpool racing truck, that Technic-building legend Sariel has chosen to recreate in his latest model. Driven by four LEGO Buggy Motors, Sariel’s racing truck harnesses the power of two BuWizz bluetooth bricks, delivering up to eight times the power of LEGO’s own Power Functions battery. That gives Sariel’s 1.5kg model a top speed approaching 20km/h, and makes it massive fun to pilot down the halls of TLCB Towers. Besides BuWizz power, RC tyres and custom stickers, Sariel’s creation is all LEGO, and really showcases how far the little Danish bricks can be pushed. 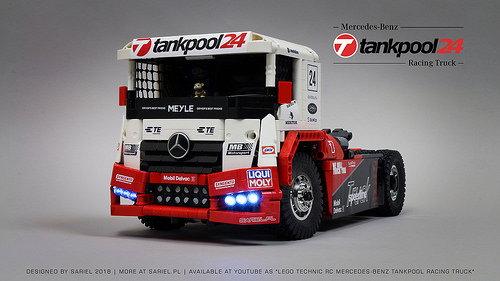 Watch the video below to see Sariel’s Mercedes-Benz Tankpool truck in action, and you can read all the details on Flickr, the Eurobricks forum, and at Sariel’s website.